Fragrant spiced Yakhni Pulao, a tantalizing Indian one-pot meal! Often when a friend wants to show you that you are important to them, they give you a signal. In the states that might include a card, a small personal gift, or helping you in some way. In different countries the signs of true friendship often takes a different form. It’s been 19 years since my last trip to India, but certain friends are still very close to my heart. Friends, that despite differences in culture, language, beliefs and age, were generous with their time and thoughts. I’m always amazed at how simple it is to find common connections when you are looking for them. These individuals extended a hand of friendship in many ways, but most effectively by offering sustenance. 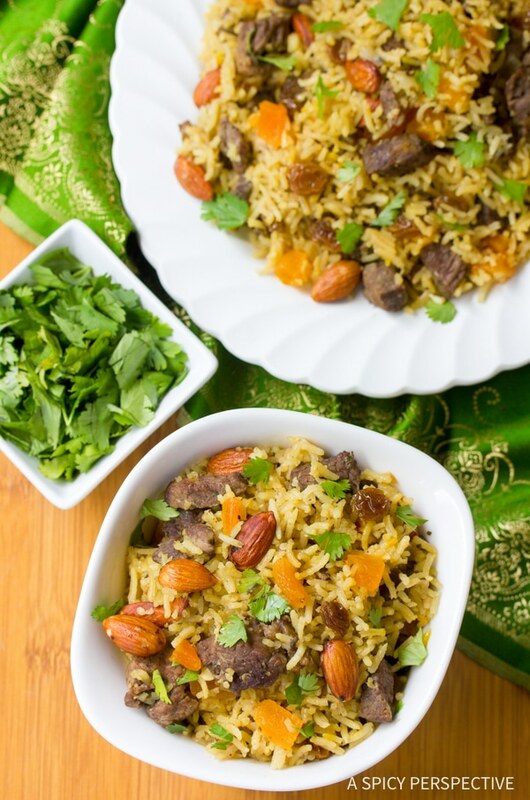 Yakhni Pulao is an Indian dish friends serve to let you know you are an honored guest. 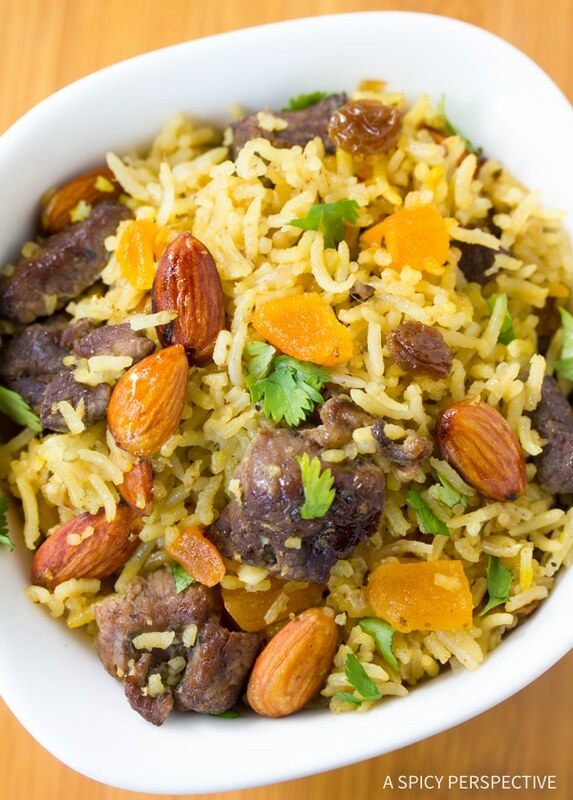 Depending on the region of India you’re in, this recipe is called Biryani or Pulao. Both are “rice and meat” dishes, but Biryani is rice layered in a large pot with meat, potatoes, yogurt, milk and spices. 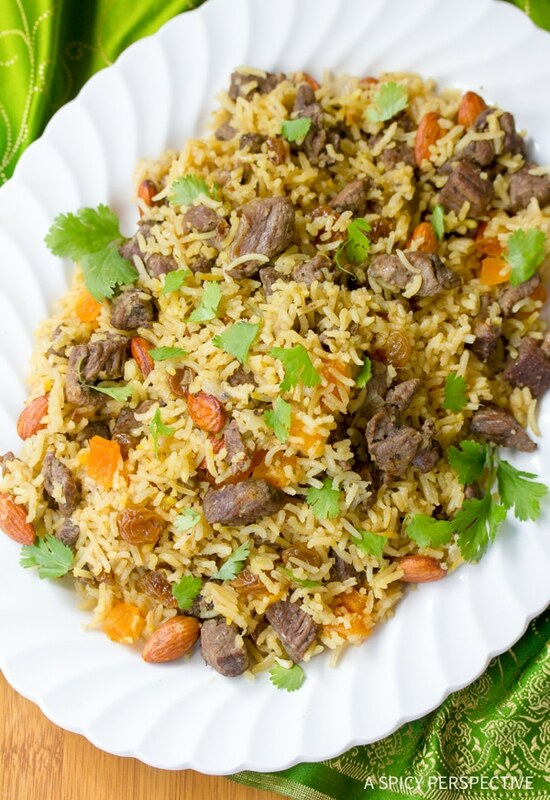 Pulao is more of a pilaf-style dish, so the meat and rice are stirred in before cooking. Yakhni Pulao tends to include meat stock, dried fruit and nuts, while biryani is silky and dense due to the inclusion of yogurt and potatoes. 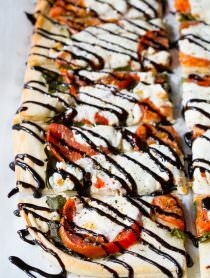 Years ago, one friend explained that these dishes were always reserved for special occasions or special guests. No different than a Thanksgiving turkey or standing rib roast. They are meals you wouldn’t whip up on just any given night! However after preparing both rice dishes, I can tell you this tradition is not due to great difficulty in the kitchen. Most likely, it has to do with cost. Yakhni Pulao is a relatively quick dish and boasts vibrant flavors and textures. The aroma itself, is worth more than a bucket of saffron. 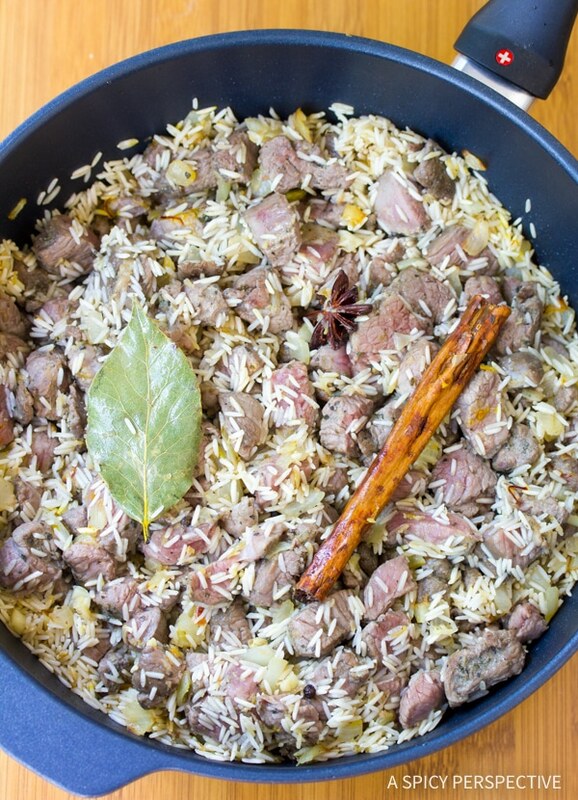 I love Yakhni Pulao best with lamb, but find it more accessible (and affordable) made with chicken… Your call! In a large stockpot heat 2 tablespoons of oil over medium heat. Add the cardamom, peppercorns, cinnamon, bay leaf, anise and saffron. Stir for 2-3 minutes, to allow the spices to release their flavor. Then add the onions. Sauté for 2-3 minutes. Add the ginger and garlic and sauté another 2 minutes. Add the chicken to the pot. Salt liberally and cook for 1-2 minutes. Next add the rice and stir to coat it in oil. Add the stock and bring to a boil. Once boiling pour the sultanas on top, cover, and reduce the heat to low. Cover and steam the rice for 15 minutes. Then remove from heat. Stir in the chopped apricots and nuts, then cover again. Allow the Yakhni Pulao to sit another 5 minutes, covered. Serve with cilantro sprinkled on top! Do we not take out all the peppercorns and cardamom pods? In India you wouldn’t take them out… Just eat around them. However, if you want to take them out, do so as you are fluffing the rice. this looks amazing! do you think it could work with brown rice? Eva, I bet it would! You know in Mumbai, they serve what is called “cutting chai” – chai served by the half glass. This chai is so strongly flavored that people have no more than half a shot glass in one go. 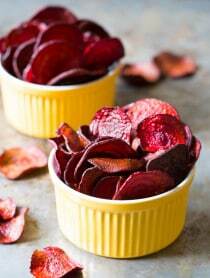 These recipes look so good! I love chai but have not ever tried to make it myself. I've discovered a local brand which is very peppery and I love that so I've not tried to take the time. Now I will! Thanks for your beautiful blog! Yes, I can attest to the specialness of briyani. It's really only served on special occasions for special people. It's a wonderful dish. It says a lot that it was served to you! OMG I love these two recipes. 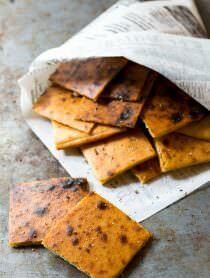 I love a good, creamy chai, and this puloa looks so good, I wish I had it for lunch today. Will have to make soon! Loved every bit of this post. The chai with added star anise and the yakhni pulao……. Chai is really the life blood in India. I really want to make the chai..I am imagining the smell from your list of ingredients. Very heady. I love the dried apricots and almonds in the rice along with the chicken. Yum. The aroma of the chai must be incredible! And the Puloa look super delicious! btw, I wanted to let you know that your rss feed didn't seem to update for this post (at least for me). Your pictures are so gorgeous. The food is so pretty! I think I need to get a better camera than the one I have, I feel like my food pictures don't always compare to some others I see! Congratulations to all the winners in your great give away! 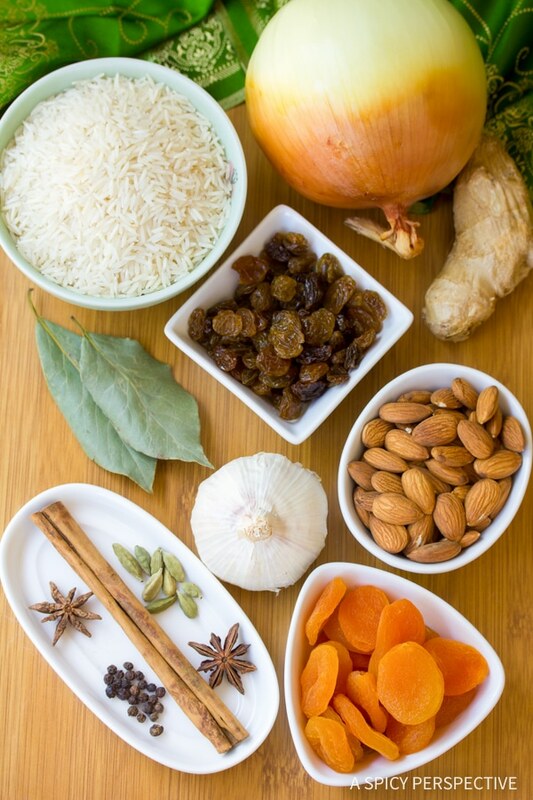 Thank you so much for a wonderful post, its always nice to learn about another culture…..the chai recipe sounds delicious, and I love both rice dishes, I particularly like the almonds in it! I have never had Indian food (on my to do list) but that chicken and rice looks delicious. I loved this post, Sommer! About old friends, about India and about food. I have never been to India and have never had chai or pulao. I'd love to try both. Divine! Can I say it louder?? Some wonderful creations here! I love Indian food…and I hope one day I can visit that beautiful country. Thank you for sharing. How funny that this is the chai of India. I just had some tonight. My mother always makes this for me when i have a stomach ache. We are middle eastern and she used to drink this also when she was young. We also call this 'shai'. Its great to see where things have come from and gone to! Great post and very tasty! Oh, and congrats to all of the winners-that's really nice & fun! p.s. I double dare, ya;)! Yummie, the rice dish looks awesome…so tasty, so colorful. What wonderful memories, Sommer! ( : I'm so excited about these authentic recipes! They are all so exotic. Very nice pictures. That chai looks divine and so does the pulao! I am a big Basmati rice fan. I am completely in love with that rice dish. It looks like all of the the things I love rolled onto one plate. Your village chai is what is popularly know as masala chai in India.And you ahve done it prefectly! And the Pulao is simple gorgeous.Its really good to see the use of authentic ingredients like cardamom & saffron in the pulao. Hi Sommer, Wow, can't believe I won, hooray! Maybe I should head for Vegas, could be my lucky day! Thanks and congratulations on your first give away, I would like to do one too. Your post and photos are wonderful, inspirational and as always delicious looking:-) I filled out the email form but wasn't sure how to send it so I don't know if you received it??? This looks beautiful and I can just imagine the fragrant smells coming from the kitchen. Actually makes me miss the cooking of my downstairs neighbor in Atlanta. I can't believe I won something. Yay!!!! Thank you so much! Hmmmmm…great chai recipe. I love pulao – never attempted to make it on my own, but maybe one day…..
Lovely and tempting rice recipe. Being of Indian background (but born and raised in California), I too find coffeehouse 'chai' laughable. Its just not thick enough. And not sweet or spicy enough. Your pulao looks gorgeous too! I love Indian food, but it's a cuisine that I haven't attempted much in my kitchen except for curries. Can I come over? OMG I'm so excited that I won something! And it's my birthday today! Yummy, that rice dish looks stunning, just the way I like, very colorful and aromatic. Will save this recipe for sure. Thanks for sharing.